First, before taking another workout, you must evaluate yourself. That is, determine your body type and frame and your body's ultimate potential. Everyone - short or tall, thin or heavy, narrow or broad - has a specific physical potential. If he attains this, he will be recognized as a physical great. 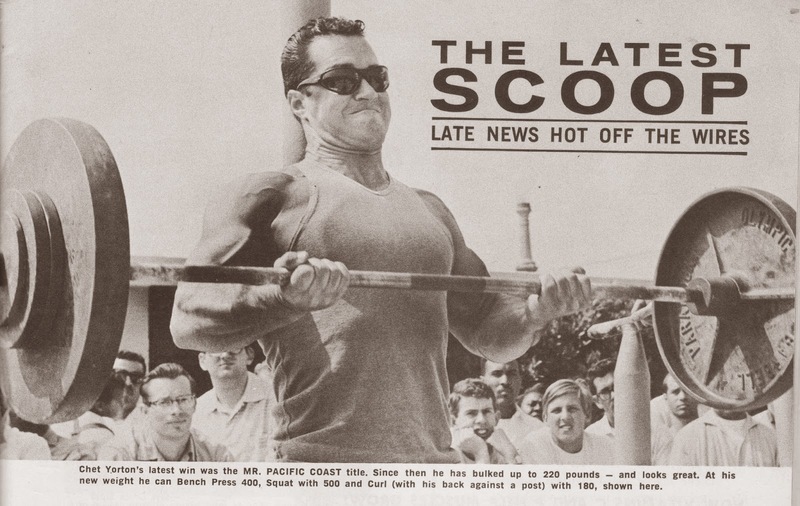 Bill Pearl could not be a Larry Scott, and Leroy Colbert could not be a Steve Reeves. Yet, each is great in his own right. The secret is to take your frame and pack as much muscle on it as possible - but in the right places. Discover your weak points and your strong points, and with this awareness arrange a routine to blitz the body parts least developed - and give those best developed less stimulation. Perform exercises to shape and form the muscles as well as to build size. Remember, everyone's body is as different as day is from night. Don't try to design yours after some great physique star. Build it naturally, as it was meant to be. Perhaps the most important and most difficult training obstacle to overcome is that of determining when any particular muscle has been exercised enough without the fear of muscle tear-down, and, consequently, only a slight muscle build-up or repair avails during the period of recuperation. Over-training is by far the more harmful of the two; it involves the hyper destruction of muscle tissue, and the tearing down of such an excessive amount of muscle cells cannot take place if build-up is to occur. Hence, your muscles not only do not grow, but in fact may reduce in size and strength. You must seek out the thread-like line dividing under-training from over-training and exercise to that point, being ever cautious not to fall short of or exceed it. To do this you must employ the trial and error system of experimentation. Train a variety of ways - high sets and reps, low sets and reps - always feeling out the most effective combination for your body. As every body structure differs, it is found that some require great amounts of work to reach the saturation point, and others very little. And too, each muscle group in not structurally alike, and each differs in the amount of training required. You may find that training for maximum pump will define your muscular point of saturation. Or, as in my case, a certain vague, flexible, alive feeling present in the muscles is the fine line of separation. In everyone this is present and it must be found for more effective and efficient workouts. Closely associated with saturation is recuperation, or that period in which the muscle tissue destroyed or torn down during a workout is repaired and rebuilt by the blood. Again, as each body differs, so does the time required for old tissue to repair and new to be built. The time required depends basically upon the body's basal metabolism, or, simply, the power of the body to change food into nutrients the body can use to supply itself with and keep it operating healthfully. Those fortunately possessing a rapid metabolism require less time for recuperation of cells. And those less fortunate require more time to recuperate. Here again you must determine to what category you are more closely related. If upon entering a workout your muscles fail to respond, refuse to pump up and circulate blood efficiently you are more likely than not training too soon after your previous exercise session. And too, muscle soreness is often a good indication of incomplete recovery. Don't train a body part if it is excessively sore. Remember: if you train without allowing ample recuperation time, you may fall victim to the dread menace of over-training, the bodybuilder's greatest fear. Having attentively evaluated your physique and having determined how much and how often your body ideally should be exercised, you are ready to design a routine "custom-suited" for you. It should be organized and uncomplicated, allowing you to move along freely without confusion. To begin, mentally divide your body into six major body parts, or muscle groups: arms, shoulders, chest, lats, midsection, and legs. You will discover the many different methods of combining body parts into a routine as your training progresses. However, basically, you will find it most effective to train each body part separately. Yet, training those closely related to each other in succession will keep the muscles flushed with blood longer in each area. Arrange your routine so as to give priority to those muscle groups least developed. That is, work them first, hardest and most deliberately. Of course, you are not to neglect an advanced body part, but rather, train it less vigorously. You will find having a clear-cut picture of the routine in your mind will eliminate much of the familiar drudgery so often associated with weight training. You know exactly what you are going to do - exactly what your body is to expect. Regard the training of each body part a a separate and complete workout, taking a deep breath and a sigh of satisfaction and a feeling of accomplishment before entering upon the next muscle group. It is important to exercise each muscle completely. This may require as many as four or five different exercises per body part, depending upon how complex its structure maybe. You must realize that every body part is not made up of one but of many separate and interdependent muscles, each requiring a different movement to be worked. Here you may find it beneficial to further divide each muscle group into sections. For example, frontal deltoid, side deltoid, and rear deltoid - applying a separate exercise to each section. There are many weight exercises and many more methods of training. Prepare carefully a combination most adequate for your body. Your choice should not be an arbitrary one, but one conscientiously and deliberately planned. As I have so often emphasized in previous articles, concentration is of invaluable importance in your workouts, and perhaps the most difficult obstacle to overcome. What is easier than allowing the mind to wander to a more pleasant subject while performing a painful and perhaps boring exercise? Yet, remember that this is defeating your sole purpose of training, for extraneous thoughts obviously diminish the effect of an exercise, because the pain subsides. And too, without extreme concentration you may perform an exercise with less strictness and perfection, thereby allowing other body parts to come into play, again diminishing the effect. Merely going through the movements is not enough. You must force yourself to shut out all foreign thoughts, focusing your mind solely on your workouts - the exercise you are performing and the muscle you are developing. Looking at the muscle directly or with the aid of a mirror is often of great assistance. Power of mind controls your every move and accounts for a great percentage of your muscular progress. Regarded by many physique stars to be the key word to physical success, consistency plays a major role in the theater of bodybuilding. There are, of course, schools of thought that oppose this belief, advocating irregular training as the most productive course to follow. However, it is the general consensus of opinion that without consistent training little progress would be made towards fine physical development. Once you've prepared your routine and have eliminated any bugs, follow it faithfully and religiously. Always trying to advance yourself, you may increase your poundages or sets as you see fit. And as you get to know your body, short layoffs at proper intervals may prove most beneficial. I used to believe that any old food was good enough - not realizing that at the age of 18 I was blubbery and fat with no symmetry or shape, and that probably my diet was in large part a cause of it. I went into hard training but ate more of the same foods. All this did was add more bulk and smooth flesh to my body. The harder I exercised, the larger I got - but the more I ate of the same foods, the more shape, definition and symmetry eluded me. I went out of my way, through diet, to drop excess fat and get more shape, separation and definition. Without altering my exercises and routines I began to drop excess weight and fat fast, and yet maintain my power and actual muscle size. In fact, I feel stronger and fitter at my present 230 pounds, instead of my regular 250. 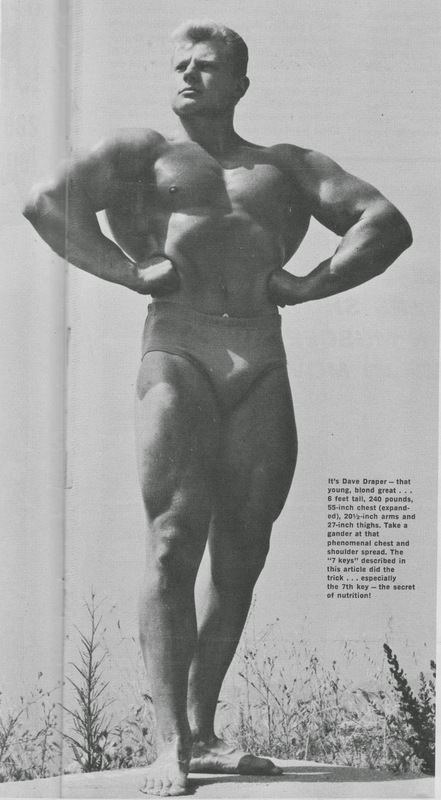 Maybe your error is improper diet - old eating habits from the days before you took up bodybuilding. If so, heed my advice - alter your diet to fit your type. If you're smooth and thick-skinned and need definition, alter your diet to suit your purpose. If you need bulk, change your eating habits. The fact that you're bulky or skinny or unsymmetrical shows that your diet and eating habits are not right for you. Like exercising, if your diet does not produce gains, they your eating habits are wrong. For proper gains you must adjust your diet to your needs. Then, working at appropriate routines properly, and eating for your type, you will commence to gain swiftly. There are times when weight training will less than agree with you, and excuses to miss a workout will run through your mind at the speed of light. Remember, at times like this, before your knees buckle getting to the gym - remember that the doing that first set is half the battle.